Khady Sylla a daughter of the water by Baba Diop. Image and text source: sudonline, 11 October 2013. Translation from French by Beti Ellerson. Filmmaker-writer Khady Sylla, author of several short stories, novels and docu-fictions passed away Tuesday, 8 October 2013. 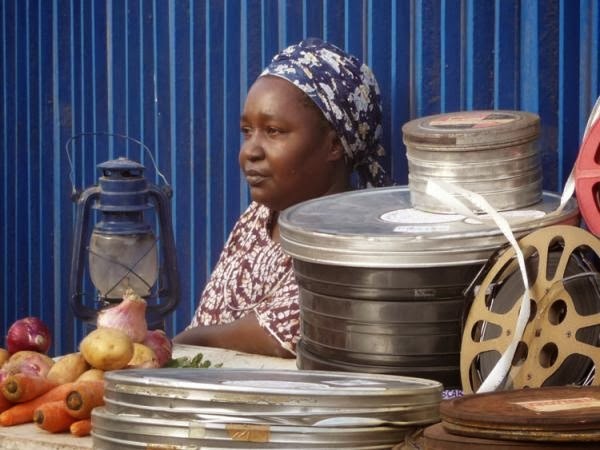 She had completed the editing of Simple parole, a long documentary about her grand-mother, co-directed with her sister Mariama Sylla, and shot in the village of Barele Ndiaye, 15 kilometers (9.32 miles) from Louga. Like Djibril Diop Mambety, filmmaker-writer Khady Sylla will not see her last film on the screen, co-directed with her sister Mariama Sylla, entitled Simple Parole. A return to the village to capture the words of one of the last guardians of the family genealogy, grandmother Penda Diogo Sarr. In the silences of this film there is a sense of a farewell. The film was carefully edited, drawing from an immersion into their grandmother’s land. Khady Sylla added her voice not realising that she would be putting her last footprint on the asphalt of Senegalese cinema, leaving to her sister the task of fine-tuning the details. Solitude, withdrawal into oneself, the incommunicability that gnaws at you, the stranglehold must be released, freeing the voice to speak, and speak again about what hurts. In summary, this is essential to the work of the writer and cineaste Khady Sylla. It would not be inaccurate to assert that very early she fell into the cinema pool. Her mother worked at the secretariat of the Actualités Sénégalaises under the direction of Paulin Sumanou Vieyra, which was the breeding ground and site for the development of the young Senegalese cinema of the period. Nicknamed “Katanga”, it was the venue of hot debates about cinema and other cinematic trends (realism versus Soviet, Italian neorealism, New Wave, Brazil Novo Cinema...). Her first plunge into directing dates from 1997 with Les bijoux, a fiction short, which she says that she placed in a rigid, straitjacketed realist style. This first attempt left the auteur with a half-hearted feeling. Not entirely satisfied, not completely unhappy. The lesson she learned was to let the camera move with greater autonomy. Having benefitted from this experience, she made Colobane Express, her second film. Considered a docu-fiction, it is a laboratory of Senegalese social reality. A reality composed of actors who play their own role. Khady Sylla’s aesthetic sense becomes more precise: to do with the image, what the Argentinian writer Borges does with words. She explains: “with his double-side words one may turn things from one side to another and see two meanings which come together.” The mystery of Jorges Luis Borges is that he uses words as if the meaning was inexhaustible or as if it renewed itself with each reading. The images of Khady Sylla are full of undertones. Nothing is explicit in what she shows. Khady Sylla also brushed against the wings of the Japanese Romantic School through the work of Yokio Mishima to which she makes reference. The Japanese author’s La mer de la fertilité recalls Khady Sylla’s Le jeu de la mer, except the former is a cycle of four novels which ends with L’ange en decomposition and the lover who slowly drifts into madness. The monologue de la muette, her next to last film, poses the gaze on domestic servants and their harsh conditions. Back to square one, Khady Sylla who came to writing incidentally through her grandmother, deceased, and here her last one Simple parole leaves for a meeting with another grandmother. 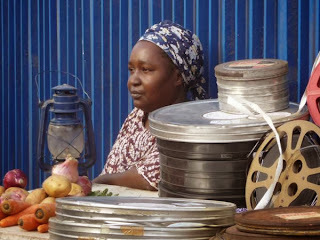 Images, excerpts from the site www.guissguisscom.com, the film sounds like a swansong in the music of Wasis Diop, the brother of Mambety.